The Unplugged Series: The Builder Dinner is hosted by City First Bank and Lee’s Flower Shop and curated by Think Local First. Starting in 2015 with our Developer Dinner Series, these sit down dinners ignite conversations that explore the impact of physical and economic development in Washington, DC. We seek to open up the lines of dialogue between government, local business owners, developers, real estate companies and cultural leaders who are helping shape the urban fabric of DC and explore the intersections at which they collide while shaping a better DC business landscape. 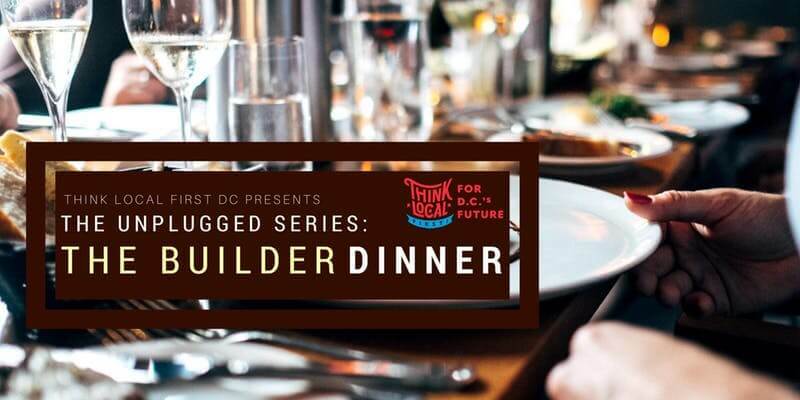 Sponsored in part by Pepco and City First Bank, The Builder Dinner will unveil transforming stories and fruitful discussions from DC small to mid-sized businesses and developers on how they are growing and scaling in business with the community in mind. 645pm – 830pm – Seated plated dinner with stories from DC businesses, realtors, and developers. Developer Dinner Series from SkipperFilms: Video Production on Vimeo.